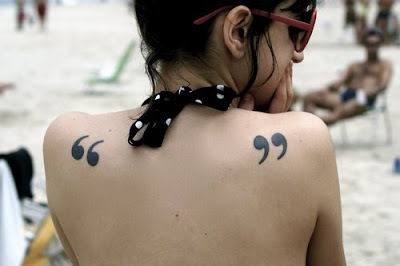 what do YOU think about tattoos…? 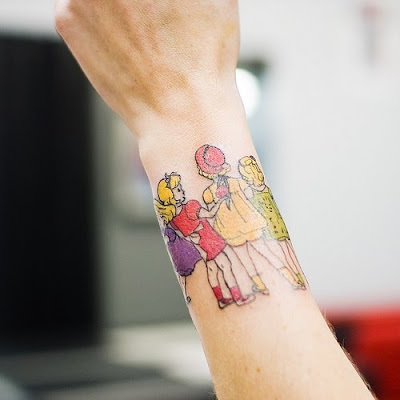 #3: this tattooof Henry Darger’s Vivian Girls? 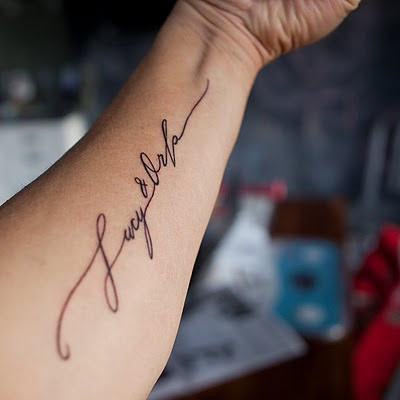 #4:Betsy Dunlap tattooed a man’s arm with his daughter’s name. How tough and sweet at the same time. 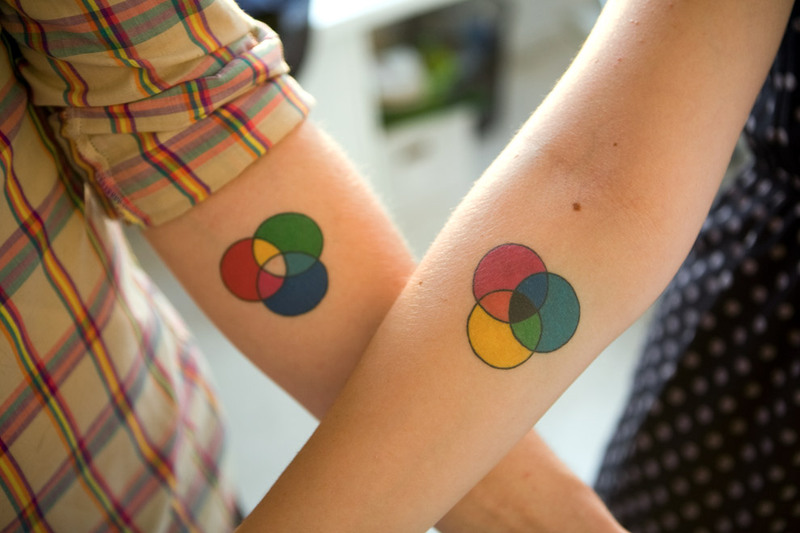 #6: How fun are these color system tattoos? Do you have a tattoo? 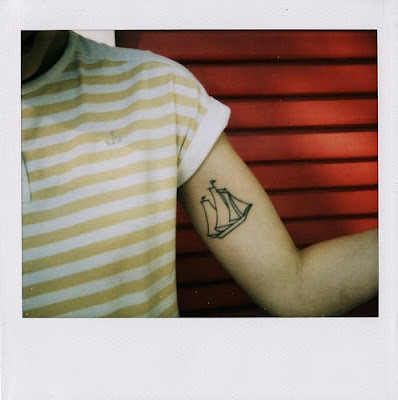 Do you often find yourself looking at other people’s tattoo’s? 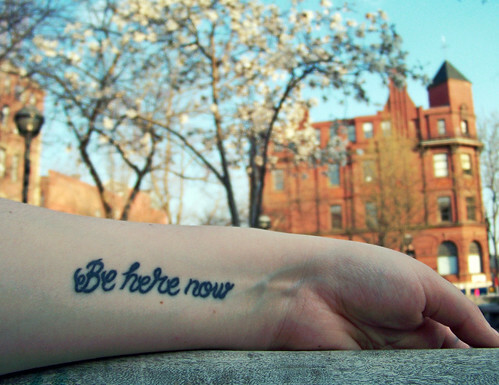 What is the best tattoo you’ve ever seen? I love 1 & 5. 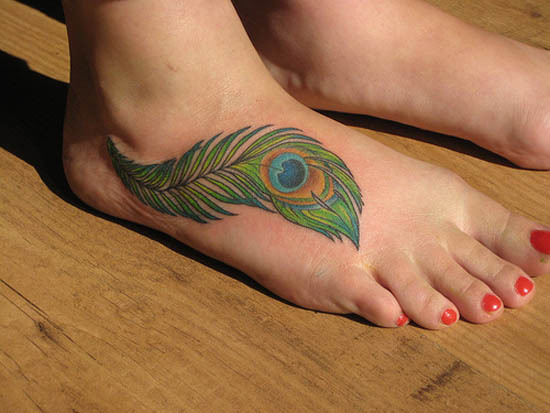 I do have a tattoo… a little wave on the inside of my ankle where I can hide it (or show it) depending on the situation! I wish I could have been a little more creative, but I love the water, the sound of the ocean, swimming, all of it, so it just fit me. That 'stache is too funny! My second was a butterfly on the left hand side of my chest with the chinese symbol for courage in it… meaning… I have been through a lot including physical & mental abuse when I was younger and I survived it all with courage. My third F/64 on my left wrist … a group of famous photographers! I got this one done when I was in school for my associates in fine arts. I am a photographer ! And last but not least (and my favorite) I have 4 stars with wind going through them and tiny twinkle stars on my right wrist… each star represents someone in my life that I have lost and is colored by their favorite color… great grandfather great grandmother my friend brad that I lost in IRAQ and last a purple star for the 3 angel babies I lost. i have three, and luckily, one of mine is my favorite tattoos i have ever seen. i have a flower, celebrating when i finally bloomed, a butterfly for my transformation when i was finally able to drop the drugs and alcohol, and a stack of books to portray a life long love of reading, and to celebrate my job of being a children's librarian so that i may make a difference to the kiddos. (you should have seen the artists face…you want. a. stack. of. books?) it is trully beautiful! Yes, I do have tattoos. 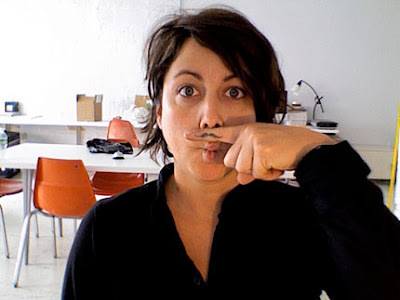 I wish I'd thought of that mustache one before I became a paranoid wuss. What a great idea! I have 3 small tattoos and I hate them all. Got 'em all in the early 90's as a freshly turned 18 year old.. enough said. I do like most of these, especially the color wheels and that peacock feather. I have two tatoos myself. One is a cross w/ a small design on either side on my lower back and the other is on top of my foot…a heart/music symbol in one and below it Ephesians 5:19. I have plans for a couple more. I love tatoos but I think they should have a meaning or special memory behind them. WOW! so many of you have meaningful tattoos… I would love to see pictures of all of them…the wave, stack of books, 4 little colorful stars…so cool 🙂 Thank you for sharing!!! I've been wanting one for a while now, but I'm still looking for the perfect design. I won't get one until I find it.